Hello everybody, today I would like to present the hidden part of my projectwork. I increased total amount of projects from 2 in April to 8 now so it`s my special technigue to support all of it carefully. Now then it`s needs strong support to keep all details, to develop projects because everyone has own stage of develop, different from another. Also it needs to make a special media to keep process of mental planing, experiments, also production and to everything perfectly in right time. Right time is really important thing. I read how professional gerdeners plan a garden: they seed plants in order every plant has own time to blossom so they put it into garden in right order. When one type of plants blossoms anothers just start to green; later it begins blossom and so on, and so on. So a garden has a perfect changes with blossoms and colours without mass and gaps. My project work is exectly the same. I seed and plant ideas carefully the same way as gardeners do, because I am a professional thinker good trained to arrange mental processes. It helps because this is the differencies between gardening and ideas. In gardening they use predictable plants but in mental field many things is flexible, unpredictable in time of seeding and blossoming and fruitage too. That`s why I invented several special features to support my processes in correct way. One of the tools is to keep all ideas before my eyes especially in relaxing places, such as kitchen. It was important because usually I do short tea ceremony in my kitchen so… my fridge was the first tool to control how the production process goes on. I started to use it during CyberWar-I, in April 2013. 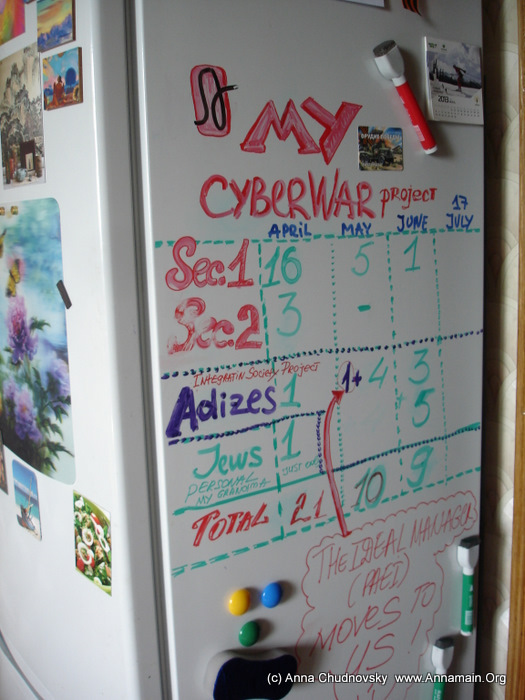 I still have that marks on the fridge although projects growth quicker and actually this is no free place on the fridge to make more notes. 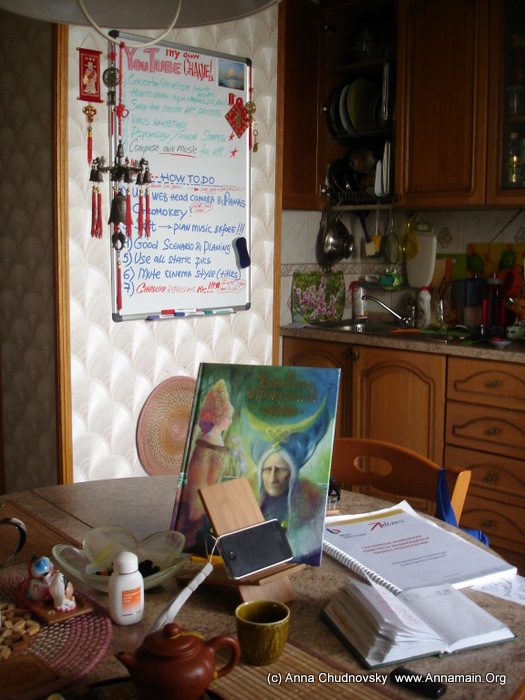 That`s why I put my new small whiteboard in the kitchen the place I can see at every moment from my tea place . Because the system I want to do is a new one, rather complicated, so when I browse around the whiteboard and have an idea I can write it immideately. 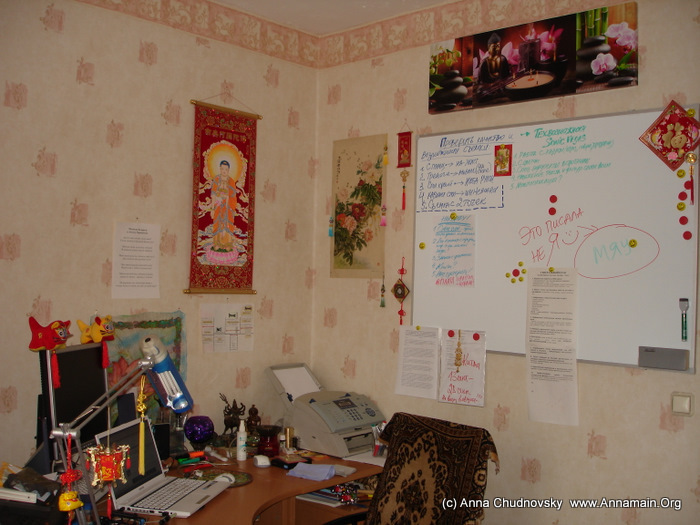 One of the tasks about that whiteboard was to make it visible from every point of view, available to make every mark and also very attractive just to browse by eyes about it in order to turn brain work. I gained all purposes. Actually it was a pleasure to decorate it according to Feng Shui en.wikipedia.org/wiki/Feng_shui principles. 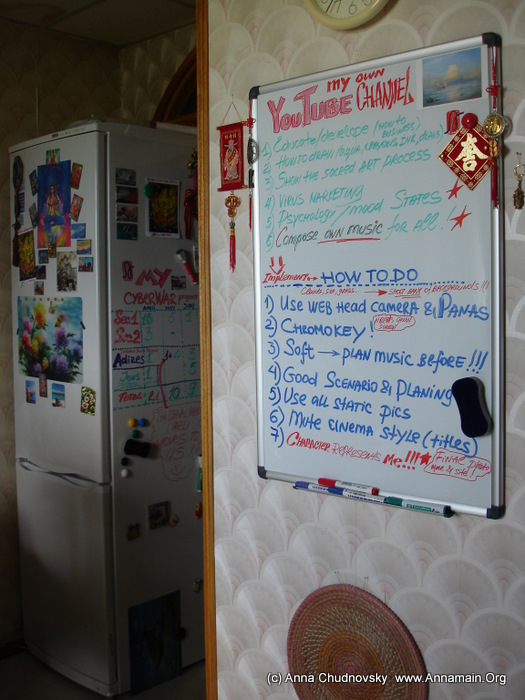 For today the small whiteboard is full of marks and texts so in that picture you can see how it look?? at the beginning. Sometimes I use the table as well using iPod and iPhone to make MindMaps and planing, for reading matherials etc. When I saw the process of project work goes wery well with such a good tool as whiteboard I bought a bigger one to my cabinet. On the picture you can see it on the first day of use. Now my Big whiteboard is nearly full of marks. It`s an interesting dinamic to see how it contains with notes and marks. So I started to make notes on a big papers and use magnets to put it on the big whiteboard. So I have no needs to clean important things out of it just because of shortage of space. Well, I love my new surrounding! It works exellent to support everything I want to do, it allows me to do much more in more short time, effective and efficient in short and long run both. That`s why I am happy to run around my whiteboards doig marks on papers, imagining the future result so clear, it is the real happiness. This is my pic I did just after my running track yesterday. I had several ideas while I run so went to the Big Whiteboard directly from my run. 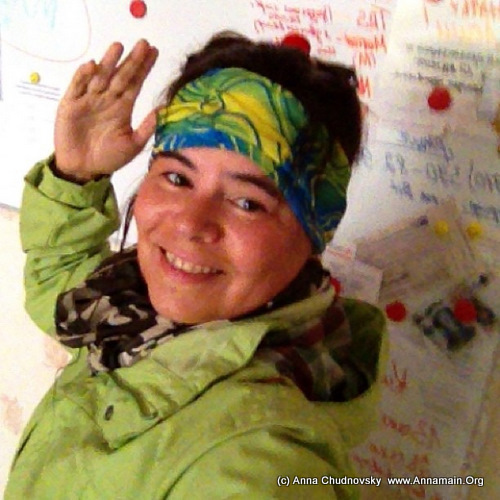 The picture isn`t clear because the rain drops to my iPhone camera, but it is good, all texts is unclear and I am not going to reveal my secret plans just in pleasure to show you how projectwork goes on. Wish you to be happy, effective and efficient and so more happy with your work!